The case of the murder of Oscar Romero, former archbishop of San Salvador, is actually proceeding in a court in El Salvador. A judge in El Salvador on Thursday reopened the nearly four-decade-old case of murdered Archbishop Oscar Romero, an icon of the Roman Catholic Church in Latin America, and asked that prosecutors seek criminal charges against the main suspect. The ruling, by Judge Ricardo Chicas, follows a decision last year by the country's constitutional court to repeal an amnesty law that prohibited criminal trials stemming from the Central American nation's bloody civil war from 1980 to 1992. The main suspect in the killing of Romero is Alvaro Rafael Saravia, a former soldier who had his case dismissed in 1993 as a result of the amnesty law. Saravia was sued in a civil lawsuit in the United States for his role in Romero's role. Saravia defaulted and never appeared in the case. 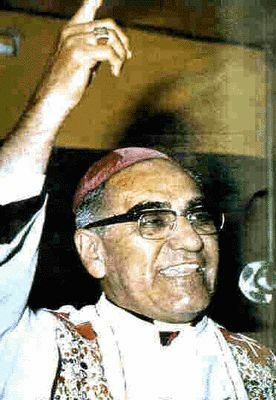 After hearing testimony about Oscar Romero's importance and Saravia's role in the murder, a federal district court entered a default judgment for $10 million. The story of that 2004 trial is recounted in the recent book Assassination of a Saint by Matt Eisenbrandt. Saravia gave interviews in 2006 and in 2010 in which he admitted his role in Romero's murder. Lawyers from the public interest law group Tutela Legal "Dra. María Julia Hernández" urged the country's attorney general (FGR) to move quickly with the reopened case with a goal of establishing the facts and responsibility for Romero's murder once and for all. This would include determining the role of other persons and the intellectual authors of the assassination of the slain archbishop. More than 35 years after the events in question, El Salvador courts now are dealing simultaneously with two of the most emblematic cases of the country's bloody conflict -- Romero's 1980 assassination and the 1981 El Mozote massacre. Although the question of whether justice can actually be served is no trifling matter, the fact that any trial should even be attempted is a huge triumph in a country where impunity has been the order of the day in these types of cases for as long as anyone can remember. At some point, we have to believe that having a trial and not getting a conviction is better than not having a trial. Having said that, however, I wonder if this case may not be better suited for a special court, some kind of war crime tribunal with international legal experts and investigators, rather than your run of the mill criminal proceeding. Certainly, the investigation required will need to rely on expert opinion, scientific evidence, and require major investigative resources. If this case is conducted properly, it could set a highwater mark not only for El Salvador but for the region.